Thank you, Virginia for testing this pattern. Read instructions all the way through before beginning cap. Yarn used Red Heart Fiesta Pink (discontinued color). 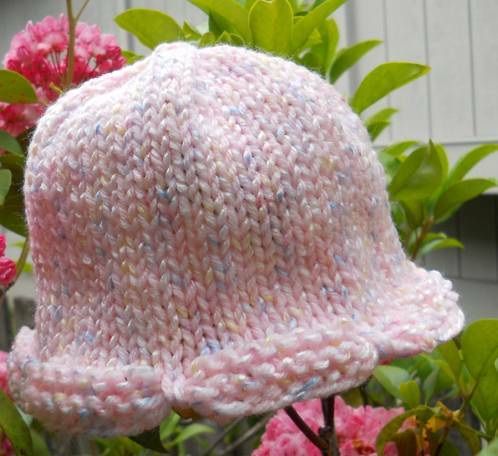 You can use your preferred method for knitting small diameter items. I like double points, but you may use two circulars or one long circular as well. Drop stitch gather stitch = DSGS: Drop the next stitch on the left needle, and unravel it all the way down including the cast on round. This will form a column of ladders. With the right hand needle go from front to back under the ladders. Wrap the working yarn around the needle in the back, and bring the newly formed loop to the front and top edge, gathering the ladders. Place this new loop on the left hand needle. Knit this loop as a regular stitch, gathering up the ladders into a scallop. Cast on 56 (64) sts with size 9 circular needle. Join and work in the round. Note: There will be 7 (8) scallops. Knit every round until cap measures 4 (4.5) inches from cast on edge. Remaining instructions are for both sizes. I report you decide, which is the right side? Edit 6/3/12 stitch count was updated. 3. If you are using one of the lighter weight (4) yarns, like Simply Soft or Pound of Love, you probably should go down a needle size and cast on 120 stitches. 4. If you want a wider blanket cast on additional stitches in increments of three. 5. Blanket in photo knit with Caron One Pound Sky Blue. With circular needle, cast on 114 sts. Repeat rows 6-9 until blanket is one inch less than desired size.